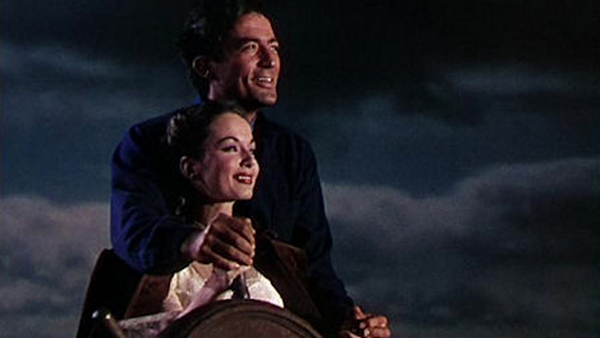 Raoul Walsh, The World in His Arms, 1952, 35 mm, color, sound, 104 minutes. LET’S TAKE FOR GRANTED the received wisdom which says that the “average moviegoer” can’t tell the difference between a 35-mm print and a Digital Cinema Package (DCP) projection. The conclusion we should draw from this isn’t that there is no difference between these formats, but that the arbiters of film culture, including critics, curators, and absolutely everyone else, have failed entirely to educate a wider public as to what this difference is, and how to talk about it. Cinema is usually a narrative art, but it is always a visual art. Nevertheless, the discussion of the former aspect has traditionally eclipsed the latter, save for within specialized circles, and when visuals are mentioned at all, it’s usually so that they can be dispensed with in a hat-tip namecheck of the cinematographer and a few shopworn, well-tested adjectives (“crisp,” “brilliant,” and other usual suspects). A brief history of DCP changeover: In March 2002 the Digital Cinema Initiative (DCI) was created through a joint venture by the six major movie studios, with the stated purpose of setting the standards for digital projection systems in anticipation of an eventual no-hitch conversion. Their connivance bore fruit in the year 2009, coinciding with the release of Avatar. Theaters that wanted to play James Cameron’s awful new movie in 3-D would need digital projection to do so. Those who could afford to—that is to say, those with corporate backing behind them—made the change en masse, while many independent, neighborhood, and seasonal theaters without the benefit of outside support were left behind, and those that didn’t close outright were gradually starved of product in the years that followed. Today, DCP has supplanted 35 mm in virtually all first-run venues, and though some holdouts—most prominent among them celebrity auteurs Christopher Nolan and Quentin Tarantino—are keeping analog celluloid alive as a distribution option, it seems very unlikely that the digital genie will be going back into the bottle. At the same time the repertory film circuit, the institutions with a vested interest in film history, and the archives that service them have carried on an ongoing debate about the merits of DCP versus original format (that is, in any feature film made before the mid-to-late aughts, usually celluloid). In early 2012, Film Forum offered a program called “This Is DCP,” inviting its audience to compare digital restorations of canonical items like The Searchers (1956) and Dr. Strangelove (1964) with 35-mm prints of the same films, with the implicit intention of helping customers stop worrying and love digital. (Press releases without fail refer to 4K DCP restorations as “stunning” or some variation thereof, which falls under the category of “Methinks thou dost protest too much.”) Some New York rep houses, including Anthology Film Archives, the Museum of the Moving Image, and the Museum of Modern Art have remained, for the most part, staunch in their dedication to presenting films on original format, though in this venues are often at the mercy of the lending policies of archives, some of which will only loan out titles in DCP. Film Forum’s “This Is DCP” was a reference to This Is Cinerama (1952), a showcase for the (ultimately flash-in-the-pan) widescreen process. Anthology Film Archives’ “This Is Celluloid” is, then, a response to the Film Forum program—as well as a challenge, part of a groundswell of efforts to increase the lay viewer’s understanding of what, precisely, they’re looking at when they go to a movie. Mary Pickford Technicolor test for The Black Pirate, 1926, 35 mm, color, 5 minutes. Print courtesy of George Eastman House; image courtesy of Deutsche Kinemathek. The DCP changeover, in both first-run and repertory exhibition, came so swiftly—and with the backing of such a powerful consortium of interests—that its unconditional victory seemed assured before the conversation had even begun in earnest. Belatedly—perhaps too late—the issue of DCP versus original format is now having its moment in the court of public opinion. “This Is Celluloid” and “Glorious Technicolor” make explicit what is implicit in any repertory series that prioritizes original format exhibition: There’s more to what you’re watching than just a title. If nothing else, it’s another chance to see what you might soon be missing. “This Is Celluloid” runs Friday, May 29–Sunday, June 21 at Anthology Film Archives in New York. “Glorious Technicolor: From George Eastman House and Beyond” runs Friday, June 5–Wednesday, August 5 at the Museum of Modern Art.